According to the National Cancer Institute, there are over 56,000 new cases of thyroid cancer in the US each year, and the majority of those diagnosed are papillary thyroid cancer—the most common type of thyroid cancer. Females are more likely to have thyroid cancer at a ratio of 3:1. Thyroid cancer can occur in any age group, although it is most common after age 30, and its aggressiveness increases significantly in older patients. Approximately 1.2 percent of all men and women will be diagnosed with thyroid cancer during the course of their lifetime. Thyroid cancer develops when cells change or mutate. The abnormal cells begin multiplying in your thyroid and, once there are enough of them, they form a tumor. Thyroid cancer occurs in the cells of the thyroid, the gland responsible for producing hormones that regulate your heart rate, blood pressure, body temperature and weight. If you experience any of these signs or symptoms, make an appointment with your doctor. Thyroid cancer isn’t common, so your doctor may investigate other causes of your signs and symptoms first. Your thyroid cancer treatment options depend on the type and stage of your thyroid cancer, your overall health, and your preferences. Most cases of thyroid cancer can be cured with treatment. Thyroidectomy: In most cases, doctors recommend removing the entire thyroid in order to treat thyroid cancer. Your surgeon makes an incision at the base of your neck to access your thyroid. In most cases, the surgeon leaves small rims of thyroid tissue around the parathyroid glands to reduce the risk of parathyroid damage. Sometimes surgeons refer to this as a near-total thyroidectomy. Thyroid lobectomy: In certain situations where the thyroid cancer is very small, your surgeon may recommend removing only one side (lobe) of your thyroid. Thyroid hormone therapy: After thyroidectomy, you’ll take the thyroid hormone medication levothyroxine (Levoxyl, Synthroid, others) for life. This medication has two benefits: It supplies the missing hormone your thyroid would normally produce, and it suppresses the production of thyroid-stimulating hormone (TSH) from your pituitary gland. High TSH levels could conceivably stimulate any remaining cancer cells to grow. You’ll likely have blood tests to check your thyroid hormone levels every few months until your doctor finds the proper dosage for you. Blood tests may continue annually. Radioactive iodine: Radioactive iodine treatment uses large doses of a form of iodine that’s radioactive. Radioactive iodine treatment is often used after thyroidectomy to destroy any remaining healthy thyroid tissue, as well as microscopic areas of thyroid cancer that weren’t removed during surgery. Radioactive iodine treatment may also be used to treat thyroid cancer that recurs after treatment or that spreads to other areas of the body. Radioactive iodine treatment comes as a capsule or liquid that you swallow. The radioactive iodine is taken up primarily by thyroid cells and thyroid cancer cells, so there’s a low risk of harming other cells in your body. External radiation therapy: Radiation therapy can also be given externally using a machine that aims high-energy beams, such as X-rays and protons, at precise points on your body (external beam radiation therapy). This treatment is typically administered a few minutes at a time, five days a week, for about five weeks. During treatment, you lie still on a table while a machine moves around you. External beam radiation therapy may be an option if you can’t undergo surgery and your cancer continues to grow after radioactive iodine treatment. Radiation therapy may also be recommended after surgery if there’s an increased risk that your cancer will recur. Chemotherapy: Chemotherapy is a drug treatment that uses chemicals to kill cancer cells. Chemotherapy is typically given as an infusion through a vein. The chemicals travel throughout your body, killing quickly growing cells, including cancer cells. Injecting alcohol into cancers: Alcohol ablation involves injecting small thyroid cancers with alcohol using imaging such as ultrasound to ensure precise placement of the injection. This treatment is helpful for treating cancer that occurs in areas that aren’t easily accessible during surgery. Your doctor may recommend this treatment if you have recurrent thyroid cancer limited to small areas in your neck. Targeted drug therapy: Targeted drug therapy uses medications that attack specific vulnerabilities in your cancer cells. These drugs target the signals that tell cancer cells to grow and divide. They’re used in people with advanced thyroid cancer. 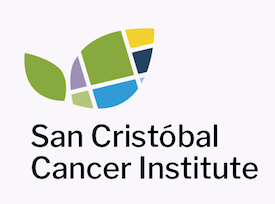 If you’d like to learn more about Thyroid Cancer through our San Cristóbal Education Resources, attend our events or learn about our Cancer Center, please contact us.